Blue Origin returned to its impressive New Shepard test flight program with a new phase of upgrades on the path towards flying paying customers into suborbit. The latest test launch took place on Tuesday, with a brand new rocket and an upgraded crew capsule that closer resembles the spacecraft that will launch passengers. 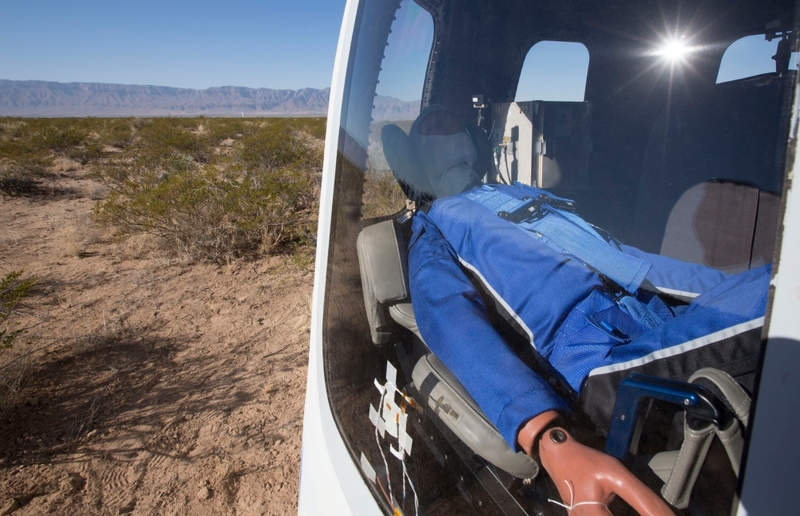 On board was the test dummy “Mannequin Skywalker”. Blue Origin debuted a new vehicle on Tuesday, taking over test operations from the since-retired vehicle that achieved numerous milestones and successes. The first New Shepard flight took place in April 2015 and saw the rocket launch successfully, delivering its Crew Capsule to an altitude of 307,000 ft – still inside Earth’s atmosphere and below the Karman line, the internationally recognized point (100 km, 62.13 mi, 328,084 feet in altitude) at which aeronautics ends and astronautics begins. However, that first test did not result in the recovery of the booster because of a loss of pressure event in the booster’s hydraulic system. The second flight occurred in November 2015 and kick-started a successful run of test flights, with the New Shepard booster lofting its Crew Module to an altitude of 329,839 feet before returning under powered control to an upright landing – marking the first time a suborbital rocket successfully landed after a straight-up/straight-down flight. 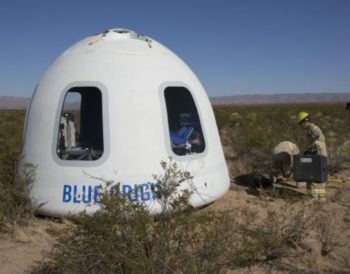 After this second full-scale test and before the third, the New Shepard booster from the second test underwent a solo, non-capsule re-flight on January 22, 2016. The third full-scale test flight of the entire New Shepard system then occurred in April 2016 in a test to provide in-flight use of a new, more efficient Reaction Control System algorithm on the capsule as well as fly two microgravity experiments inside the capsule. 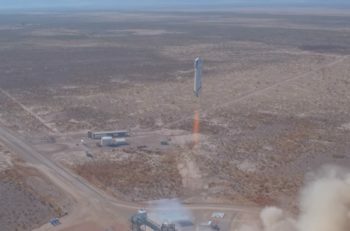 With those three successful tests of the same booster under its belt, Blue Origin embarked on its fourth test, which again tested the New Shepard’s ability to launch and land successfully. 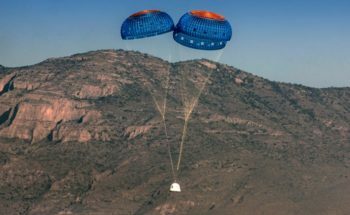 Importantly, the fourth test – and following fifth test – provided valuable, in-flight data and risk assessment for a single-parachute out scenario for New Shepard’s capsule. That previous test series concluded with a successful abort test, which was expected to result in the loss of the booster. The October 2016 test closed out a run of four successful test flights in the year, with the latter testing its new pusher abort system that’s designed to safely separate the New Shepherd crew capsule from the New Shepard booster in the event of an anomaly during powered flight. 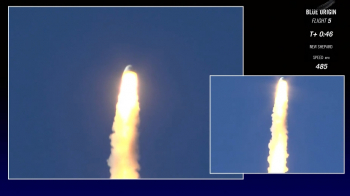 It was expected the exhaust from the pusher system would impact on the booster. However, it continued to fly and then successfully landed, along with the crew capsule, which was the primary goal of the test. The prize for the booster’s survival was a well-earned retirement from test operations and a tour of Blue Origin events around the United States. While those latter tests were webcast by Blue Origin, the company opted to keep their return to New Shepard testing out of the media spotlight. The only news a return to testing was about to occur came from the required NOTAM (Notice To Airmen) of a test at the West Texas facility. Even after the test was conducted, only a Federal Aviation Administration (FAA) notice provided an official confirmation the vehicle had flown. 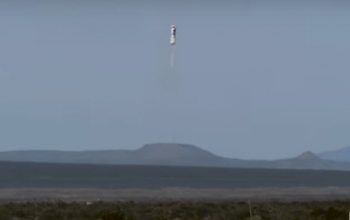 However, late in the day, Blue Origin owner Jeff Bezos tweeted a video of the test, showing both the booster and capsule returned successfully. The video also provided additional details on the upgrades. Further details noted this test was called Mission 7 (M7), featuring a next-generation booster – powered by its BE-3 engine – and the first flight of Crew Capsule 2.0, a spacecraft that now features real windows, measuring 2.4 x 3.6 feet. The test flight also carried 12 payloads and even a passenger – specifically an instrumented dummy brilliantly named “Mannequin Skywalker”. Further details noted the flight time was 10 minutes and six seconds, launching at 10:59 a.m. CT from Blue Origin’s West Texas test site. The booster achieved Mach 2.94 on ascent & Mach 3.74 on descent. It again showed its landing skills, as shown on the video released by Mr. Bezos. “Today’s flight of New Shepard was a tremendous success. It marks the inaugural flight of our next-generation Crew Capsule as we continue step-by-step progress in our test flight program,” noted Bob Smith, CEO of Blue Origin. The return to New Shepard testing is just one element of Blue Origin’s current drives, with continued work taking place on the test program for the BE-4 engine, which will power the larger New Glenn rocket. 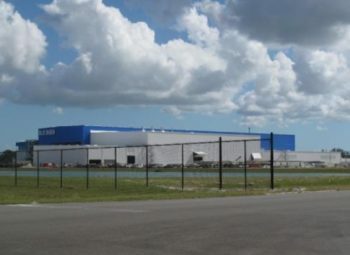 With a large production facility on Merritt Island nearing completion of its initial build, construction of their launch pad and testing facilities proceeding well, and a successful first firing of their BE-4 engine, Blue Origin is on track to meet the company’s stated goal of debuting their New Glenn heavy-lift launch vehicle sometime in 2020. A dedication ceremony for the huge factory on the Space Coast could occur before the end of the year.